Six green sea turtles were released into the Gulf of Mexico on Thursday, August 9th 2018 promptly at 9:00 am central/10:00 am eastern. 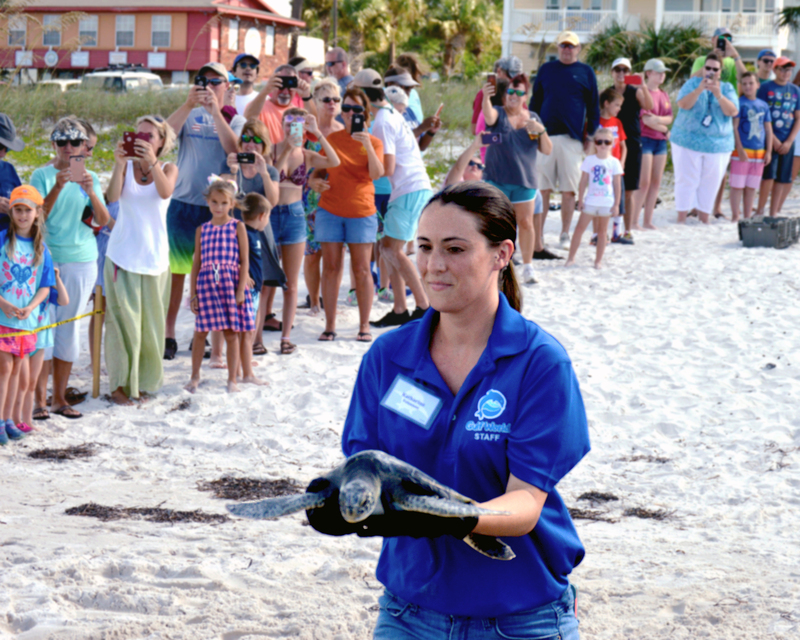 The release took place at 9435 West Highway 98 Port St Joe, FL 32456 across from the Lookout Lounge. Paddy re-stranded on July 27thafter being released on July 17thin Mexico Beach. The animal was given a thorough medical evaluation that did not present a medical cause for its stranding. Rocket was found on March 25thoff of Crooked Island covered in barnacles and extremely malnourished. The four cold stunned sea turtles were a part of a much larger group of 1200 sea turtles that stranded in January during the second largest recorded cold stun event in the Florida panhandle. Sea turtles essentially become shocked by the frigid temperatures when in shallow bays and estuaries. The majority of these animals were already released, however, there were several patients that stayed behind due to secondary illnesses such as pneumonia. Each animal is given individual care and the rehabilitation time varies depending on the animal’s case. Paddy, Rocket and the four cold stunned sea turtles were all diving and foraging successfully and were medically cleared for release.